Of the many things I looked forward to experiencing at TCM Classic Film Festival 2017, checking out the Grauman's Egyptian Theatre remodel and the four nitrate films to be shown there were at the top of my list. I have wanted to see film on nitrate for years. Stories of how the format shimmers, and brings out the depth of images fascinated me, not to mention that the stock actually has silver in it. This is literally how the term "the silver screen" came to be. While I have always enjoyed seeing films at the Grauman's Egyptian Theatre, at last year's festival I noticed how threadbare the carpet had become and that parts of the building were beginning to crumble away. It was clear that the facilities needed some TLC. This year I was delighted to find the theatre looking as good as new. The Egyptian Theatre was last remodeled in 1998, when the not-for-profit cultural organization American Cinematheque took on ownership of the building and launched a massive renovation project. This restoration returned the theatre to its former glory and updated its technology. However, after nearly two decades of heavy use, the theatre was once again in need of attention. Water leakage caused extensive damage to the ceilings inside and in the portico just off the forecourt of the building. The elaborate Egyptian-themed paintings in the forecourt were faded and cracked by the elements. In addition to worn carpet, the auditorium seats were beginning to show their age. While not as elaborate as the last restoration, it nevertheless took a major effort to once again restore the theatre. With funding primarily from The Hollywood Foreign Press Association, all these issues were addressed, from restoring the murals and inside paint, to fixing the water damage and ensuring that the building was better protected from rain and other elements. A gorgeous design and that new carpet smell! Every seat in the auditorium was recovered and new, custom-designed carpets were installed. One of the most fascinating elements of these new floor coverings is that their design mirrors that of the ceiling details in the auditorium. A semi-circle starburst on the floor of the theatre entry matches exactly with the design inside the theatre. In addition to restoring the facility, the projection room was completely rebuilt to accommodate new technology and to enable the safe projection of nitrate film. Fire curtains, high-tech extinguishing equipment and other features will help to ensure that if any nitrate film ignites during a screening, the theatre and its patrons will remain unharmed. In her opening night introduction, Deborah Stoiber, collection manager of the moving image department of George Eastman Museum told the audience that the ability to show nitrate at the theatre, from facilities to films was funded by The Hollywood Foreign Press Association, Turner Classic Movies and The Film Foundation in partnership with the American Cinematheque and the Academy Film Archive. That's an impressive group, offering an amazing experience for classic film fans. It is easy to see why TCM staff were so eager for festival goers to attend the four nitrate films on the schedule. 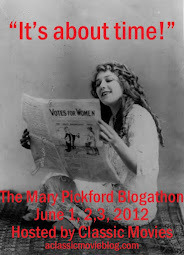 I liked the films that were selected, because they offered a diverse look at nitrate film. Two black and white and two color films were shown and each was stunning in its own way. There was Alfred Hitchcock's original 1934 take on The Man Who Knew Too Much, the quintessential noir Laura (1944), Powell and Pressburger's visually stunning Black Narcissus (1947) and the odd, but beautiful Lady in the Dark (1944). I found the format to be a revelation, with sometimes subtle, but often noticeable differences in the way light and shadow appeared on the screen, and images more lush and with deeper dimension. These were among my favorite screenings of the festival, living up to my expectations for an excitingly different cinematic experience. One of the most interesting things I noticed about viewing nitrate with an audience, was that it was not a unanimously thrilling experience. Some festival goers were rendered speechless by the beauty of the images, while others were completely underwhelmed. I spoke to quite a few attendees who could not see what was so magical about this format. 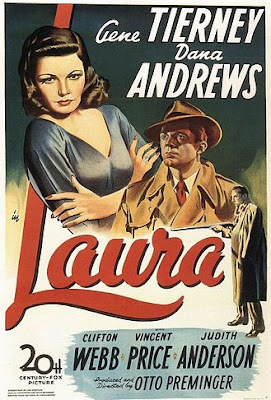 While my seatmates raved about the look of Laura, another audience member was disappointed in the experience and felt it was a bad print. I hadn't expected that division of opinion and still haven't got a theory as to why so many of us experienced nitrate in such dramatically different ways, though you could really say the same thing about tastes in film overall. A nitrate film was shown each night of the festival at the Egyptian. Stoiber spoke about the opening night selection, sharing some information about the film print itself. Struck in 1946 for David O. Selznick, it had been donated to the George Eastman Museum by his son Danny. The producer had been interested in viewing the British works of his contracted director Hitchcock. 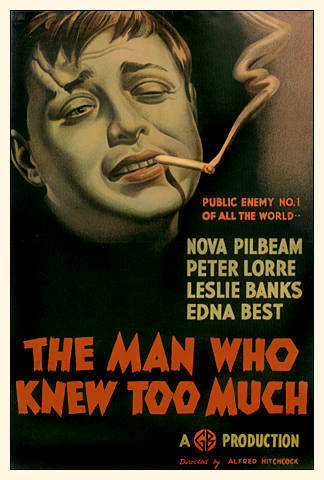 Stoiber also noted that this was Peter Lorre's first film in English. Then Martin Scorcese took to the podium to offer a more wide-ranging assessment of nitrate, which I found to be an essential introduction. He noted the drawbacks of the format: that it was highly flammable, did not even extinguish in water and would decompose into powder. He said that by the late forties the format had been replaced by acetate, also known as safety stock. No further feature films were made with nitrate after around 1952. The director told a groaning audience that many nitrate prints had been destroyed so that the silver in them could be removed. Then Scorsese raved about the look of nitrate: how its high silver content resulted in deeper blacks, and a greater spectrum of greys and how with Technicolor the colors were pressed into the film, as if the images were embossed, making the films highly resistant to fading. He called the format, "a different kind of beauty," with lustrous images and a luminosity to it. I don't know how I would have experienced The Man Who Knew Too Much without this introduction giving me a sort of heads up as to what to observe. I suspect I probably would have thought it was exceptionally filmed or a high quality print. As it was, I saw exactly what Scorsese was talking about, not at first, but as the film progressed. In this tightly-paced, tense Hitchcock thriller, there are lots of dramatic contrasts in color. I first understood the power of those contrasts in a nightclub scene in which the deep blacks of the men's tuxedos were a stunning contrast to the shimmering glow of the ladies' gowns. I also enjoyed the almost liquid look of the light when it reflected on shiny objects, and in particular the way it snaked down the barrel of a gun in a climactic scene. On the light side of the spectrum, I was spellbound by several profile shots of leading lady Edna Best, where the light on her skin and curled coiffure seemed almost to take on a life of its own. The most stunning visual effects were in the tense final scene, which took place at night. My first glimpse of the deep blacks on a dark street made me gasp. They were so intense and showed so much detail. Overall I felt more engaged in this film which I had always liked, but not found terribly interesting, because the visual experience was more dramatic. 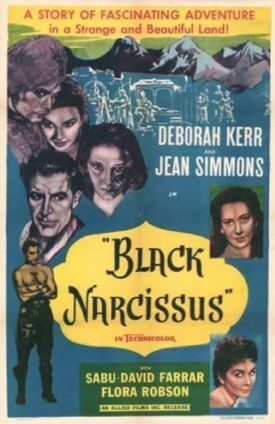 The screening of this Otto Preminger film noir was my favorite of the black and white nitrate presentations. In contrast to the more stark feel of The Man Who Knew Too Much, the look of Laura was luxurious and sensual. I understood what Scorsese meant when he said it was, "one of the most haunting uses of black and white." While the rest of the nitrate films shown tended to have certain moments where the effect of the format was more pronounced, viewing this film was a uniformly mesmerizing experience. As many in the audience had seen the film several times before, there was a bit of collective disappointment that there were so many breaks in the film. Those who had all but memorized the script were somewhat taken out of the moment by lines that cut out in the middle and other minor breaks. I wasn't too bothered by this, but that was most likely because I had attended the screening with the intention of making the most of the nitrate experience. In his opening night comments, Scorsese said that he believed this 70-year-old print was one he had seen at the Academy theater in the 1970s. He said he had been late to the screening and sat in the third row, which to him made the film appear like 3D. After wandering the theater with a pair of seatmates as indecisive as I am, we ended up in the second row and got to see the film as he had. Normally I hate sitting that close, but I suspected it would be an amazing way to see this film, and I was right. This intense story of a group of nuns who attempt to establish a nunnery in the Himalayas, only to be driven mad by the strange environment and mystical feel of the place is best experienced in total immersion. It was at this screening that I found the most rapt response from the audience. There were moments when I could tell that others were experiencing the same wonder I was. The most stunning moment was in a flashback scene with Deborah Kerr, in which she is standing with a fishing pole in a river. I remember thinking this was a pretty scene before, but the sparkle of the water in nitrate was unreal. You could feel a crowd of hundreds collectively holding its breath. I still think about that moment with wonder, because I never knew film could have such an utterly overwhelming effect. I also found it interesting which scenes were most entrancing to me in nitrate. While the mountain backdrops were as beautiful as I expected, I found that the interiors most often grabbed my attention, from the play of light on a nun's habit, to the flicker of a young student's eyes. There's one scene in particular that amazed me, where a simple bar cart appeared as perfectly bathed in light as a Vermeer, with the bottles and glasses shimmering and seeming almost to be 3D. My final nitrate film was also the last of the festival for me. Scorsese had praised its, "real, vibrant Technicolor," but I had heard the story of this rarely seen film was not to modern tastes. This was the one nitrate film that most of the audience hadn't seen, and there was an interesting buzz about it afterwards. It stars Ginger Rogers as a emotionally-conflicted magazine editor who is chided by her co-worker Ray Milland for her seriousness and supposedly plain and manly clothes. She struggles to understand her anxiety, and her reluctance to commit to both her longtime lover (Warner Baxter) and a much sought-after movie star (Jon Hall) who takes an interest in her. She begins to see a psychiatrist (Barry Sullivan), who brings all his 1940s male chauvinism to her diagnosis, but does uncover the reasons for her distress. This is a profoundly sexist film. While I was a little surprised by the pearl clutching by audience members afterwards, after all, as classic film fans we see plenty of plots like this one, I did have to admit that this take on the duties and roles of females was particularly distasteful. Even Rogers' therapist thinks that she'll be fine as long as she eases up on the work responsibilities and starts dressing prettier. I still adored this film though, because like most films directed by Mitchell Leisen, it is gorgeous. 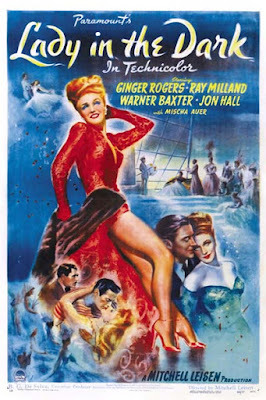 With outrageous costumes by Edith Head, including a show-stopping mink and sequin number that cost thousands, luxurious set dressings and surreal dream sequences that could stand on their own as entertaining shorts, this was definitely a film to soak in on a superficial level. If you can set aside your analysis of 1940s society, it can be an intensely enjoyable experience. Once again it was clear why Lady in the Dark had been chosen for the nitrate screenings. The colors really popped, skin looked velvety and touchable and even something as simple as a leather chair had a shimmering wow factor. I am delighted that my nitrate experience at TCMFF turned out to be as impressive as I'd hoped. Though I don’t know if I prefer it to other formats, I do think it is a wonderful way to view films. I'd love to see more movies on nitrate and hope that TCM will screen the format again in future festivals. Check out my full TCMFF 2017 coverage here. I didn't see The Man Who Knew Too Much, Laura or Lady in the Dark but I did see Black Narcissus. It was the one film I was determined to see at the festival. The scene you mention in which Deborah Kerr is shown standing in a river, fishing, was incredible. Absolutely dazzling and mesmerizing. It's true, it was as though the entire audience held its breath at that moment. Okay, so I wasn't just imagining that! It literally felt like no one was breathing. Such a memorable moment.